We love the flavours of our Thai basil so much that we try to do the same sauce with different proteins. For a simple, no-hassle, even no-fear-of-cross-contamination meal, we used already marinated tofu easily found in Asian grocery stores. The ingredients get a quick roundabout in a hot wok, and in less than 15 minutes, the dish is ready to serve. Maybe it's just me, but I like hot and spicy dishes like these with cold rice. Heat oil in a wok or large saute pan over high heat. When hot, add crushed garlic and chile peppers. Stir-fry for around 30 seconds. 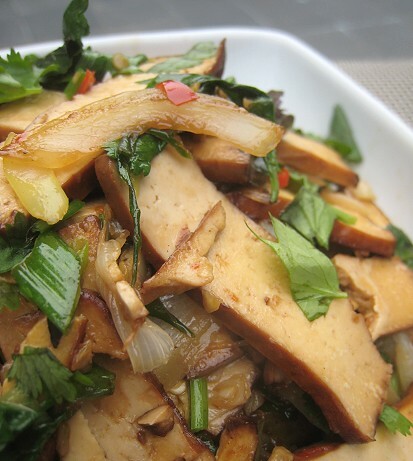 Add sliced tofu, then oyster sauce and fish sauce. Add sliced onions and green onions. Stir until the ingredients are cooked through, around 1 to 2 minutes. Turn off heat. Stir in Thai basil (and cilantro, if using). Serve with plain white rice. Fried eggs (sunny-side up) would also be great. I love Thai basil. Sounds great with tofu! I love stir fries with basil too, they give such wonderful flavours. yum yum! I have never tried the premarinated tofu, but I might now. I love the flavors in this dish - yum! Haha, I thought we were already diverging from the "authentic" by adding cilantro. But, if you want more cilantro, we can add more! We do love our cilantro as well. Thanks! We don't cook too much with Thai basil, other than this stir-fry, and perhaps San Bei Chicken. So, we should definitely start thinking outside the box in terms of Thai basil usage. Haha, I think for me, room-temp rice is OK. Lukewarm, too. Cold-cold, not so much. re pre-marinated tofu: In this case, since the flavors of the stir-fry itself were pretty strong, I think using plain old firm tofu would've worked. 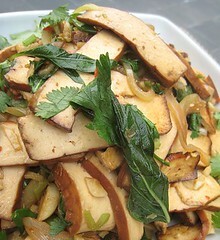 Will have to try the marinated tofu "as is", or in a plainer dish. Haha... I guess because stir-fries are sometimes a "clean out the fridge" type dish.